Is GDP a Leading Stock Market Indicator? Many investors try to use Gross Domestic Product (GDP) and GDP growth as a leading indicator of stock market returns.Under this theory, changes in GDP or the rate of GDP growth precede and could cause stock markets to react and move in response. This is usually not the case. In fact the reverse is usually true, meaning that the stock market often moves up or down as a leading indicator of the economy. Stock Market will Drop Further. Although common stocks have declined significantly, their prices are still high by historical standards. Over the years, the prices of stocks have sold on average for about 15 times their previous year’s earnings. By this measure, stocks are still high. The Dow Jones Industrial Average has a 20 price-earnings ratio; the S & P 500 Index has a 22 ratio; and the over-valued NASDAQ stocks still sell for over 50 times earnings. As a result, economic growth or recession is more often than not trailing behind the movement of stock market returns. Movements in the market might precede movements in the economy because investors are forward looking and anticipating economic growth or recession before it actually happens. Another possibility is that as investors have less money as the result of a market downturn, they spend less money in the economy causing a reduction in GDP. Gross Domestic Product (GDP) is the total value of all final goods and services produced in a country during a year. Services (such as the fee you pay for lawyers and electricians) are included as well as tangible manufactured goods. 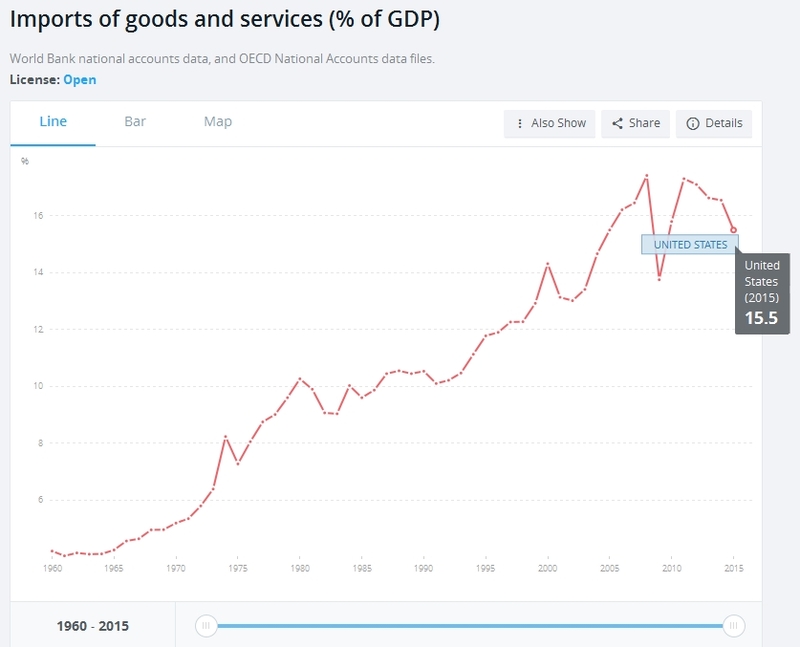 Only final goods and services are included in GDP. Intermediate goods which are used to make final goods are not counted. Wheat which is made into flour which is baked into bread is only counted when the bread is finally sold. This avoids triple-counting the value of the wheat and double-counting the added value of the flour. The symbol which is commonly used for GDP is the letter Y to represent the Yield produced from a country’s resources. What are the components of GDP? The latest values for each component (Consumption, Investment, Government Spending, and Net Exports) can always be found on the Federal Reserve Bank of St. Louis website. Real Personal Consumption Expenditures for Q2 2016 was 11,482.8 billion or 69.2% of GDP. Many false economic conclusions are drawn from the fact that consumer spending is almost 70% of gross domestic product. One of the most common assumptions is that the economy won’t recover until consumers start spending again. Since GDP attempts to measure production, we wrongly assume that increasing spending equals increasing production. 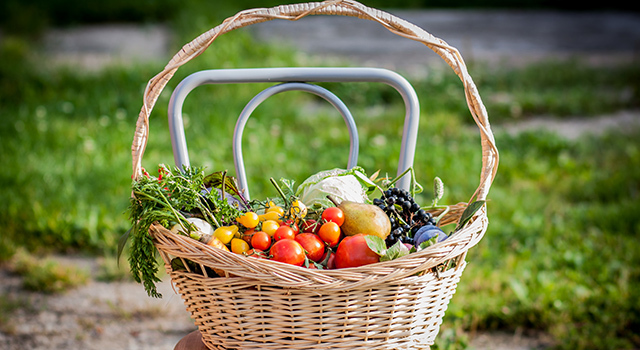 But many of the dollars that are spent on consumption don’t go to domestic production. Instead, they purchase goods and services produced in other countries. Consumption includes the $2.8 trillion of national health expenditure (about 17.5% of GDP). Much of that spending comes from the federal government as Medicare or Medicaid spending. Increased government spending on healthcare counts as consumer spending and increases GDP. But, government healthcare spending is projected to grow 1.3 percent faster than GDP and is expected to reach 20.1 percent of GDP by 2025. Finance, insurance, real estate, rental, leasing, health care, social assistance, professional, business, and educational services account for more than 40% of GDP. Retail and wholesale trade creates another 12% of the wealth. Government-related services fuel 13% of GDP. Utilities, transportation and warehousing, and information account for 10% of the GDP. Manufacturing, mining, and construction constitute 17% of the output. Agriculture accounts for only 1.5% of the GDP, yet due to use of advanced technologies, the United States is a net exporter of food. Real Gross Private Domestic Investment for Q2 2016 was 2,769.6 billion or 16.7% of GDP. Gross Private Domestic Investment is the amount of money that domestic businesses invest in their own country. It includes business expenditures, expenditures by landlords, and changes in inventories that are held by businesses. Real Government Consumption Expenditures and Gross Investment for Q2 2016 was 2,906.608 billion or 17.5% of GDP. The 17.5% of GDP represented by government spending is very different than total government expenditures. We know from Tax Freedom Day that the government collects about 31% of the nation’s income. And we know that the government is running a deficit which means that spending is even higher than revenue. The deficit adds an additional 3% to 8%. The difference between government spending that counts as part of GDP and government spending that does not is about 13.5% of GDP government spending. That 13.5% goes to transfer payments rather than expenditures on goods and services. In other words, 13.5% of government spending is not counted in GDP because it doesn’t purchase anything. It takes money from one group of people and then gives that money, often, to a different group of people. These transfer payments include welfare programs, subsidies, unemployment insurance, and Social Security. Real Net Exports of Goods and Services for Q2 2016 was -556.3 billion or -3.4% of GDP. Globalization goes both ways as the United States exported $1.45 trillion in 2014, making it the second largest exporter in the world. The Observatory of Economic Complexity at the MIT Media Lab has a nice visualization of what we export as a country. Exports have been increasing at an annualized rate of 8.5% for the past five years. For those who lived through the 1970s, perhaps the most surprising statistic is that the largest component of exports is the 7.11% of exports represented by the Refined Petroleum we send to other countries. Click here for the latest data on exports. Click here for the latest data on imports. Nominal GDP is GDP as measured in current dollars. These are the dollars of the day and are not adjusted for inflation. Click here for the current annual chart. Real GDP is GDP as measured in current dollars and then adjusted according to inflation. Real GDP is also known as “constant-price,” “inflation-corrected” GDP, or “constant dollar GDP”. Since Real GDP is adjusted according to inflation, all the numbers are adjusted to a base-year. GDP Constant Prices (Real GDP) are reported quarterly in this chart. Click here for the latest quarterly chart. Once GDP values have been adjusted for inflation (put into constant dollars using a base year), then the most common measurement for growth is to measure the current quarter’s inflation-adjusted amount with the previous quarter’s inflation-adjusted amount. The resulting percentage is then annualized by multiplying by 4 (since there are four quarters in a year). This is often abbreviated QoQ meaning “Quarter over Quarter.” Quarter over Quarter Real GDP Growth is what is most commonly meant by the GDP Growth Rate. GDP Growth Rate (Annualized Real GDP growth Quarter over Quarter) is reported in this chart. Click here for the latest quarter. 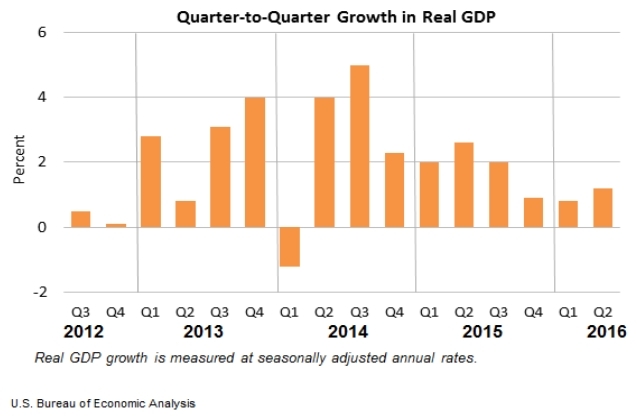 The Bureau of Economic Analysis also provides a Quarter-to-Quarter Growth in Real GDP graph. Click here for the current quarter’s chart. Annual Growth Rate commonly means taking the current quarter’s real GDP and comparing it to the same quarter from a year ago. This is often referred to as Year over Year GDP Growth and abbreviated YoY GDP Growth. GDP Annual Growth Rate (Annualized Real GDP Growth Year over Year) is reported in this chart. Click here for the latest quarter. 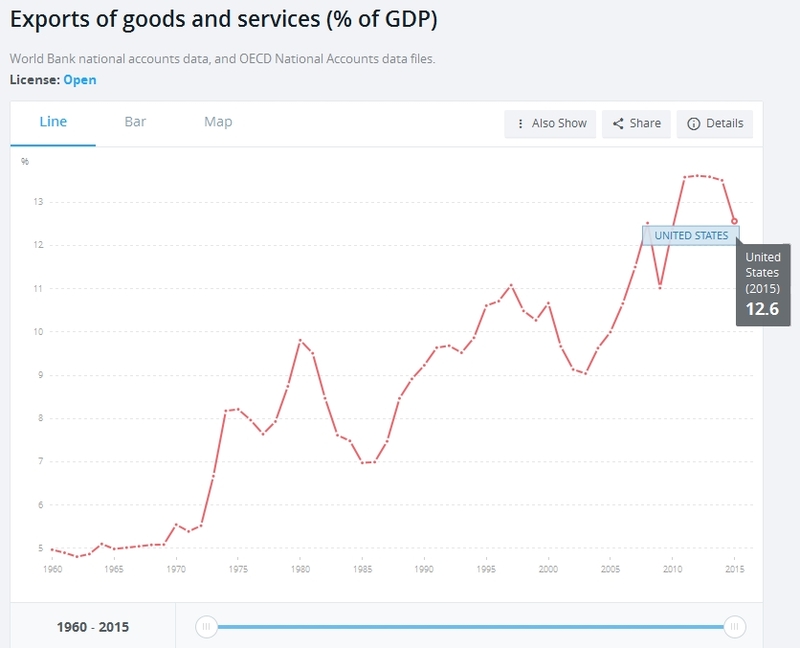 Statistics on Gross Domestic Product (GDP) are available from the Bureau of Economic Analysis. Their statistics can break GDP into the Value Added by Industry as a Percentage of Gross Domestic Product. Government currently represents about 13% of GDP. 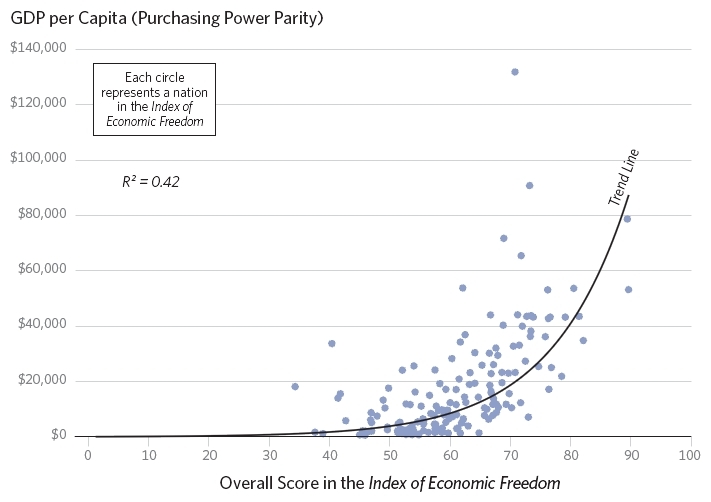 When economic freedom declined, so did the growth of per capita GDP. The relationship between a freer economy and the higher growth illustrated by these statistics is no coincidence. The index measures real elements of economic structures and policies. 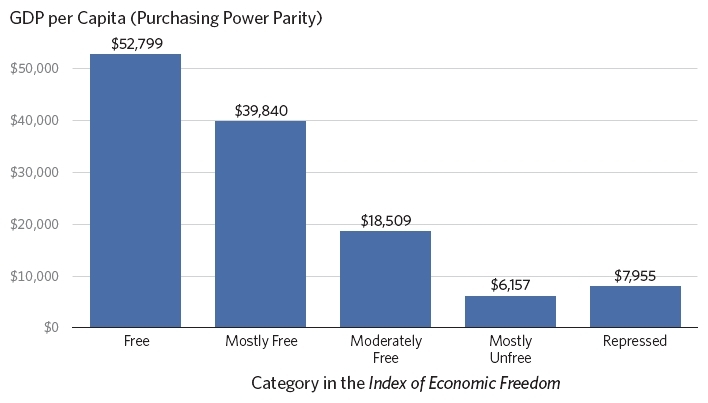 The consistent, positive relationship between economic freedom and economic growth provides powerful evidence that Adam Smith was right more than 200 years ago. Free economies give citizens the opportunity for more productivity and higher incomes. The best way to reduce global poverty is to increase economic freedom.